WTC 2019 is getting closer and closer and since I would like to participate in it as a member of Polish National Team, I went to Szczecin to take part in WTC practice games day, the only one out of three I could attend to in December. 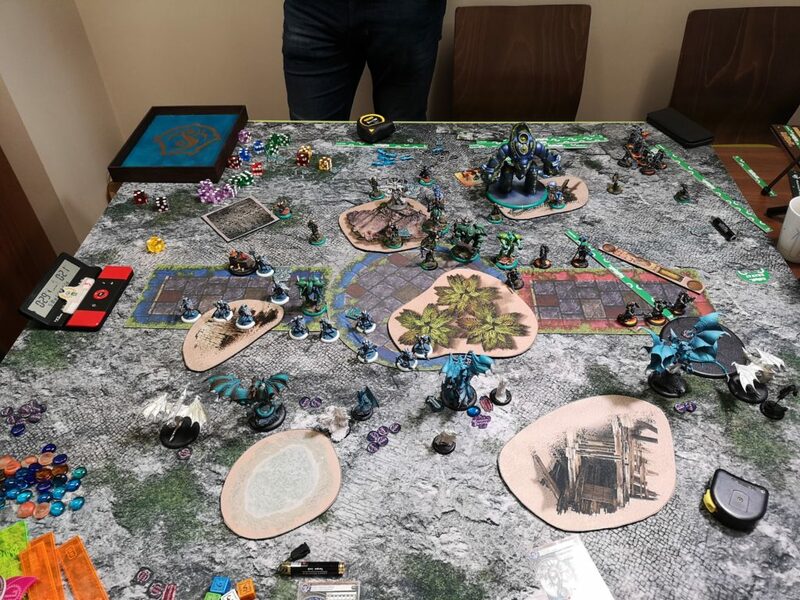 The first out of three games that day I played against Rafał, a respected warmachine player from Poznań. He brought Retribution and I took my Legion, Thag2 and Anamag without Chosen as they are still unavailable. As soon as they arrive I will probably change my pairing. Due to Goreshade’s abilities and feat I was sure that it was going to be a tough match. I had to use my long charge ranges with flanking Angelii and during Goreshade’s feat use my numerous spray attacks. That was going to involve precise positioning. 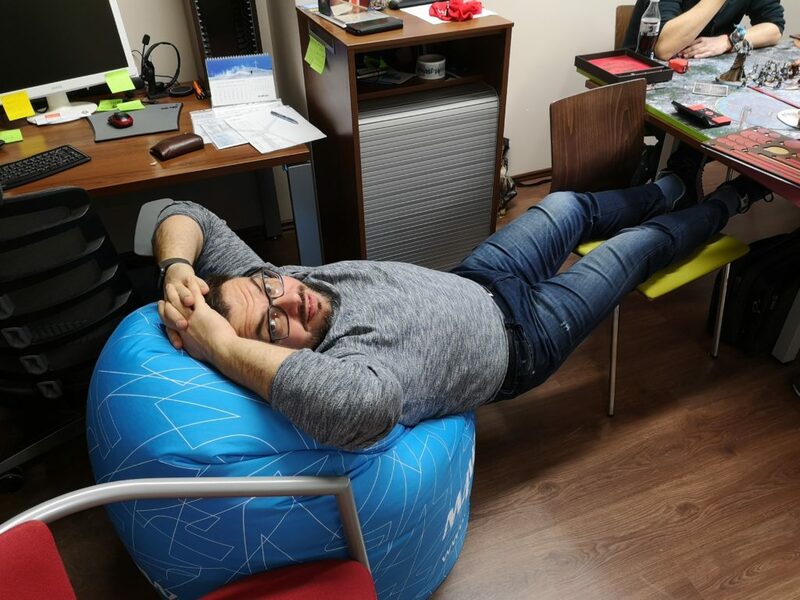 Rafał was proxing the newest battle enginge – Trident – with a colossal. I was proxing my battle engine with a modest flat proxy base. For psychological impact I should have used Archangel or something of similar posture I believe 😉 Unfortunately, I didn’t take photos every round. It was one of many things I forgot that day. I won the roll and decided to start. That gave me a slight table advantage. I deployed my models in a very similar way as I usualy do. Thag2 with Typhon and Seraph in the middle. Angelii and Helions on both flanks. I paced Naga on the left and Throne on the right. Ice witches and support pieces somewhere in the back. Rafał deployed his warcaster and Sphinx in the middle with both Chimeras on flanks. Both units of Halberdiers on both sides of Goreshade. Trident took position on the right flank. I approached safely keeping everything outside of his threat ranges. I made a mistake that at first might not seem to be too important, but in the end I believe it had a significant impact on the outcome of this match. 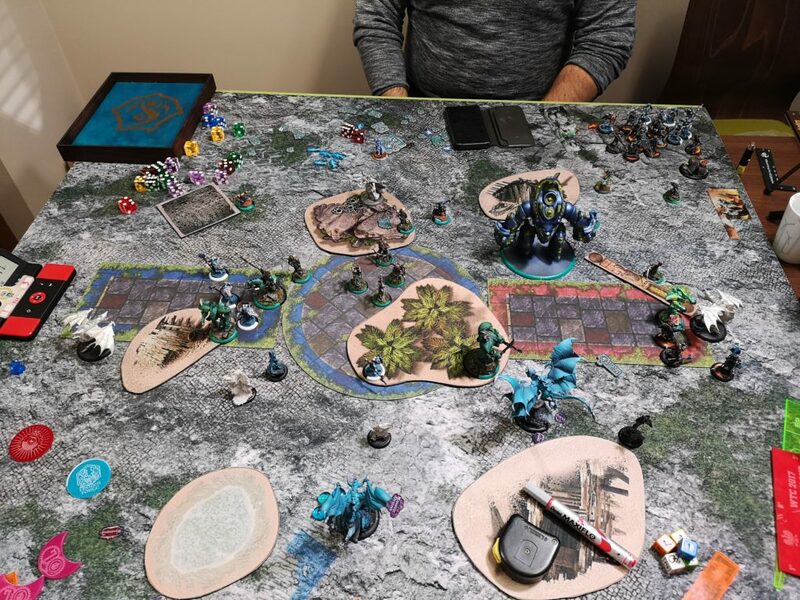 I placed both Angelii quite far from the central part of the table where Thagrosh2 was, preventing me this way from slip streaming both of them. Rafał didn’t hesitate to take advantage of ma cautious advance and marched forward. Both units with shield wall, one with +3ARM and tough. That many models with high armour were definately a tough nut to crack. 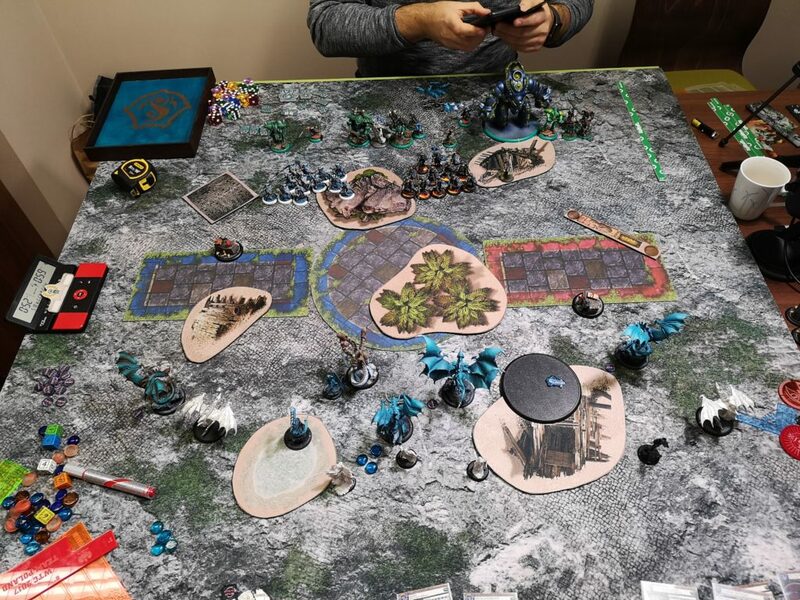 Due to my positioning mistake in Round 1 I couldn’t charge in with both of my Angelii before Goreshade would feat and that was indeed a sad information, because I was going to be overrun on one flank for sure. Puppet Master cast on crucial models. I decided to go in with my right slip streamed Angelius and with Manifest Destiny and Overtake I managed to kill many Halberdiers there. Typhon moved in and sprayed three times leaving couple of dudes alive within a charge range. Angelius on the left side could only shot once and move back with my feat movement. Throne toed into the zone and stayed quite safe back. Rafał replied with wrecking my front lines. I exposed Typhon to charges, 5 to be exact, and that was enough to put him down to the box. I killed the wrong guy with Angelius apparently, because 4 wouldn’t be enough. Typhon was crucial to sustain the attrition game on Goreshade’s feat turn, which Rafał used that turn obviously. I should have slip streamed the three-headed beast behind the forest, instead of the right Angelius forward (he was in charge range of Eiryss hidden behind the wall. With MD and PM I would be able to hit her), but that wasn’t the case. I’ve got overrun on both flanks and there was no way out at this point. 3:0 in Ret’s favour. I’ve continued playing, but at this stage it was hopeless and Rafał had to seal the victory. I killed the objective to get at least 1 scenario point, but I didn’t have enough models to get back to the game. In his turn Rafał killed the last Angelius and Throne and the game was over. We shook hands. Before the game I knew it was going to be a dificult match up, so I wasn’t surprised by the outcome knowing immediately what mistakes I made. Wrong positioning and not keeping Typhon safe till the feat turn came were the reasons I lost. What’s more, I got a confirmation, that Thagrosh2 really doesn’t like to play against something that can slow him down, take one turn away and stop the momentum. This list has to keep being aggresive and push forward no matter what. When the opposing list can prevent me from killing models and control what I do, then I’m doomed. That was an important lesson and although I lost terribly I felt satisfied with the conclusions. It probably would go better if I would at least keep Typhon alive. Next time. Next game I played against Marcin Nowicki and his fancy Japanese style Skorne.